So “they” say events that trigger memories of your childhood will also trigger a return of those childhood feelings. So I couldn’t help but notice the childhood giddiness that brews when I’m obsessing over shoes, bags, clothes, etc. I find myself daydreaming about those childhood fashion icons I once had, and wonder how those influences have molded my style into what it is today………..
It’s really hard for me to pinpoint where this obsession began. But from the time I can remember my mother always had a million pairs of shoes. I couldn’t wait until I was “old enough” to fit into her shoes, well that day finally came. Every time I go to visit I raid her closet and leave with new shoes, and find myself trying to talk her out of more. 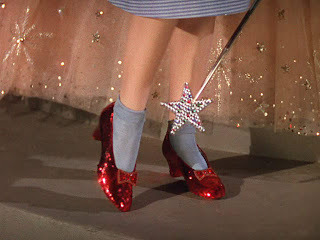 But the earliest memory I have was without a doubt the Wizard of Oz. Bright, shiny, red, sparkly, sequin heels, what little girl didn’t want those…..I know I did. The same way I drooled over those sequined heels as a child, sure enough came right back around. I found myself in these later years drooling over another pair of sequined heels, Christian Louboutin! I picture myself clicking my heels in these,there's no place like a great party in sequined Christian Louboutins! I was once asked how many bags I had and I threw out some ridiculously low number (20) only because I had never really taken inventory, so I got home that day and actually counted them, and well.......it was closer to 80. And I must admit I was shocked that I had more than 20 but even more shocked that it was ONLY 80! This addiction was a little easier to pinpoint. And yes I blame it on Miss Mary Poppins! 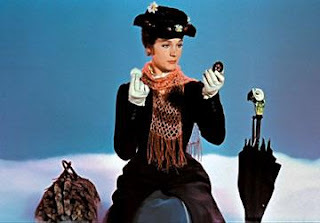 Not only did I think she was practically perfect in every way when I was younger, from her tailored outfits to her impeccable posture, but I loved that wonderful carpet bag! I do own many small bags which generally consist of clutches. However the vast majority of my bags are large, and will carry anything and everything. So even though I won't being pulling lamps or potted plants out of my bag, 9 times out of 10 I am carrying some random item that someone needs! I love this YSL bag that Kate Moss is Carrying! It's the kind of bag that doesn't appear to large but will hold mucho. Just like good ol Mary Poppins I believe that Kate Moss and her style are practically perfect in every way! As a little girl it was always fun to play dress up, by far my favorite game. I can honestly admit that this game has only gotten better with time! San Francisco based photographer obsessed with fashion-y things and getting on planes.